Go Godzilla! Win the 농구 game!. . Wallpaper and background images in the Godzilla club tagged: godzilla picture images photo basketball. that was something from a shoe commerical. 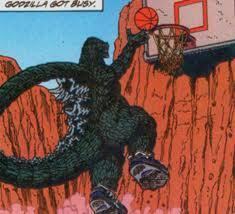 Kinda weird..... he's a monster that destroys towns, protects the earth, and such now's he's playing basketball??!!! !